Moms run the house hold and manage a lot between work, kids, relationships and sanity. Why the heck do we need one day to celebrate moms?! It’s blatantly a commercial holiday. What happens the rest of the year when we’re slaving away, running around, trying to maintain our self-worth? We get a mix of spit up, dirty diapers, talking back, side-eyed for feeding our babies, tantrums and more. Ok, it’s not that bad. There are bright sides that make us feel glad we had children. Like their hugs, kisses, I love you’s, mother’s day cards and the occasional thank you from our partners. BUT why celebrate our worth as moms one day?? So for Mother’s Day, I encourage you to keep it simple! Choose quality over quantity. Spend the day with your children creating memories and leave the material stuff behind. 2. Get active by going to the park, hiking, swimming, running or even bowling. 3. Have a movie night at home with popcorn, brownies from the box and tacos with the kiddos. 4. Get artsy by painting and doing arts and crafts with the kids. 5. Have a BBQ at home. Get that bottle of wine and sit back while your partner cooks. OR order in. Some supermarkets like Publix and Shop Rite also have cooked food ready. Pick up a rotisserie, potato salad and cake! There’s so much you can do that costs very little and relies on very little thought. AND you can re-create these memorable moments throughout the year. Ditch the expense and fancy stuff. Keep Mother’s Day to the love and memories. 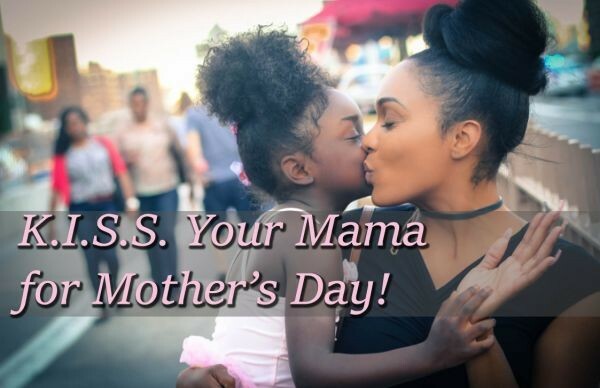 KISS your mama!